So i end up using fingertrip in windows and something like this ingame (this isnt my photo) so it doesn't touch. My hand size is 19'5x9. and the mouses that i have and tried: Razer Deathadder, CM Alcor, Razer Abyssus and Sharkoon Fireglider. The Abyssus didn't work for you? Check out the CM "Xornet II". It's a really strange shape and very short and I remember I thought the mouse was unusually flat. I don't know if it's still sold. 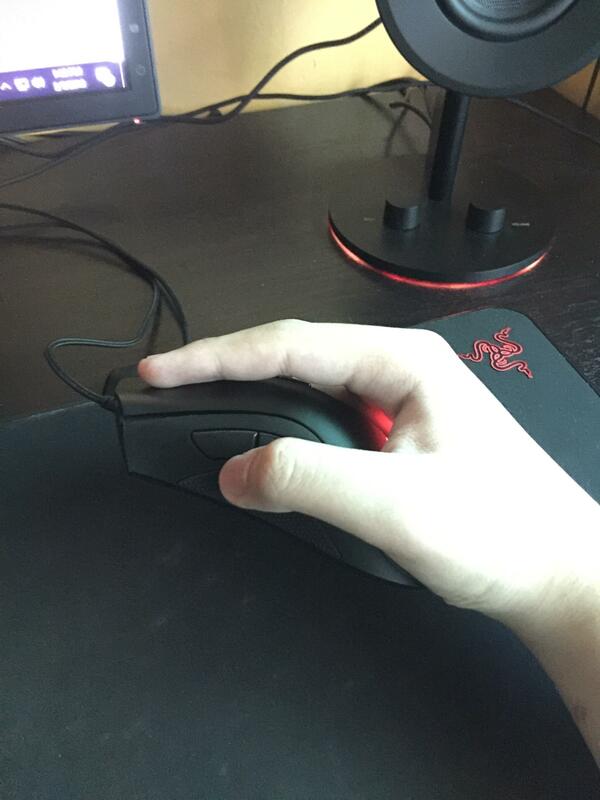 You could try to find a really small mouse so that only fingertip grip works. There are a clones of the "Logitech Mini" shape from Chinese and Korean brands, but I don't know what names to search for and where to get them. Im using the Abyssus at the momment. Great for web broswing, but makes my fingers clenched when playing, i guess because of tension when claw gripping. So im not sure of using this smaller mouse. It's the very first Abyssus, so the dimensions are smaller than the Abyssus released after. You have some big hands man. Have you tried looking at the new MX518 or G400 series from logitech? They usually work well with palm grips. I have been a long time claw gripper. I had the abyssus for years, probably 6, and claw on a narrow mouse is the way to go for me. I tried that corsair m65 recently but gotdang it was not working for me and I wanted to like it so bad! Ended up going with a harpoon wired, and its been great for claw grip. FPS, browsing, you name it. I like it a lot. I have fairly big hands and so far the only mouse that is comfortable to me is the Mionix Naos. It is a simple mouse, wired and kinda light.